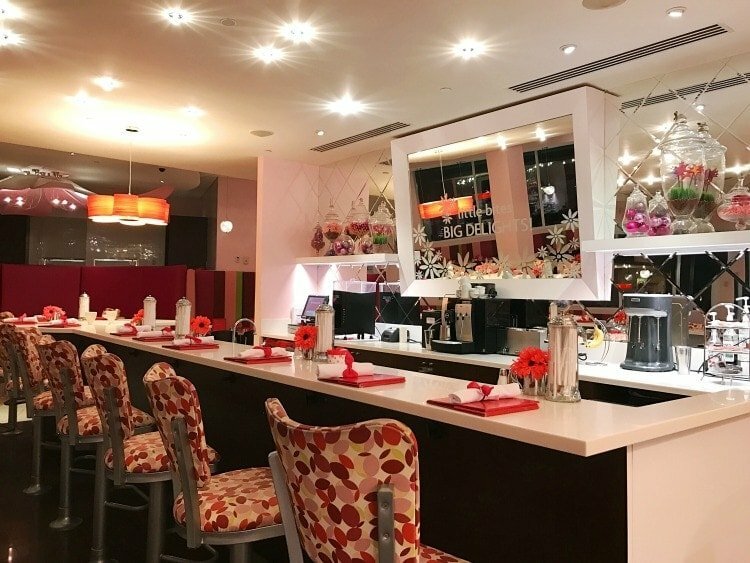 American Girl Bistro Alpharetta – Celebrating your son or daughter’s special day with a birthday at the American Girl Bistro. We celebrated our daughter’s birthday per her special request, and we did it American Girl style. We really enjoyed our dinner at American Girl Bistro in North Point Mall. It is always a wonderful treat when we go. I want to thank Awesome Alpharetta and American Girl Bistro in Alpharetta, GA for hosting this memorable day for us! This restaurant review was a hosted event. All opinions are my own. Before our dining reservations, we stopped at the American Girl store next door so the birthday girl could choose her birthday gift. She chose Gabriella. Gabriella McBride is the 2017 Girl of The Year. We also brought along Melody for the birthday dinner. Melody’s voice echoes the hope of a nation. If my girls had it their way, they would have also brought their Rebekah, Caroline, Grace, Me Dolls and the Bitty Twins. American Girl has been a part our lives for some time. So, yes we are really an American Girl family. 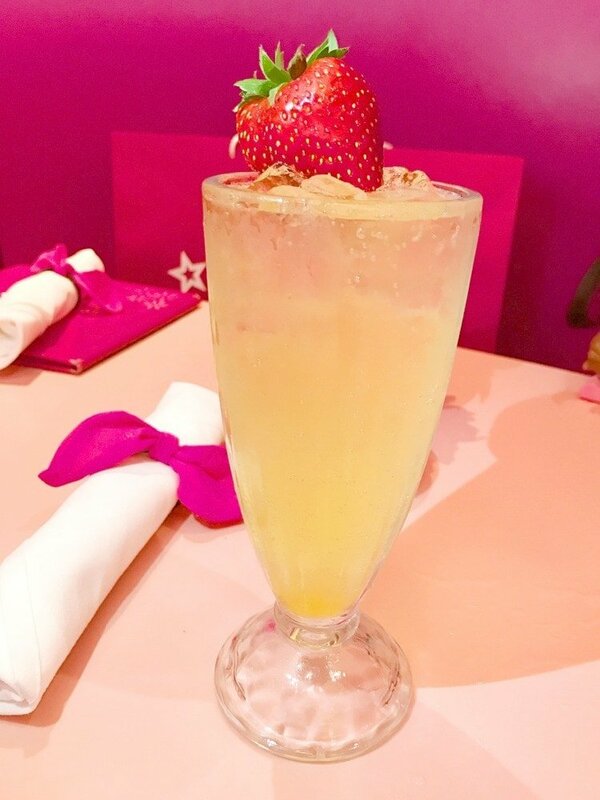 Let me start out by saying what I love about American Girl Bistro. The girls can include the dolls in the dining experience. The girls enjoy this part very much. I especially love the cute highchairs provided. But don’t worry if you do not have your own American Girl doll. They offer plenty for you to choose from and bring to the table. 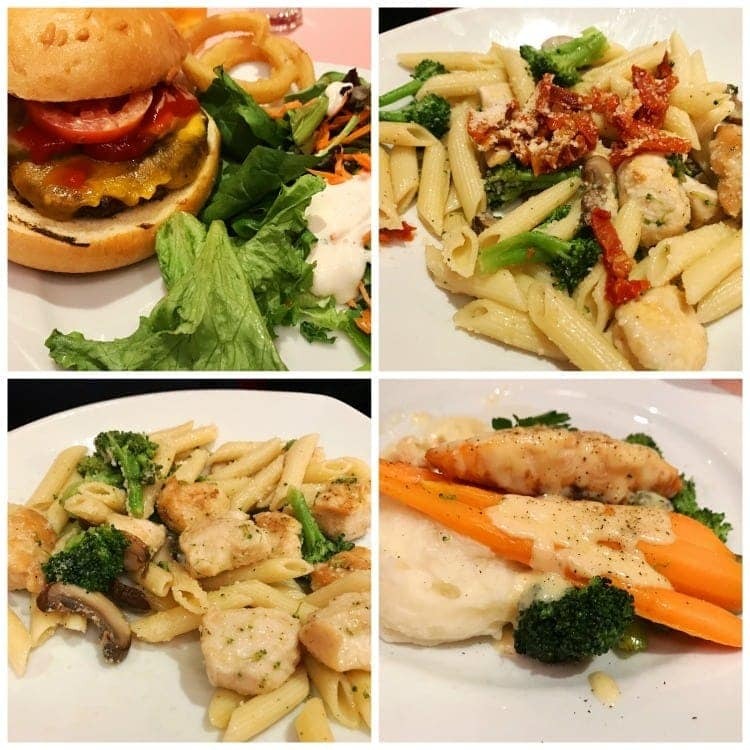 The Bistro offers Brunch, Lunch, Afternoon Tea and Dinner. We dined for dinner. We had the Macaroni & Cheese Bites for starters and that was delicious. For the main course, my girls had the Penne Pasta With Chicken, Brocolli, and Sun-Dried Tomatoes. I had the Herb-Roasted Salmon With Citrus Buerre Blanc. Everything was very tasty and no crumbs were left behind. My younger daughter had the Mango Citrus Soda to wash down her delicious meal. We were celebrating my older daughter’s birthday and although we did not celebrate with an all-inclusive birthday package, the waitress was still wonderful about making sure her birthday was extra special. At the end of the night, the waiters and waitresses all sang happy birthday. 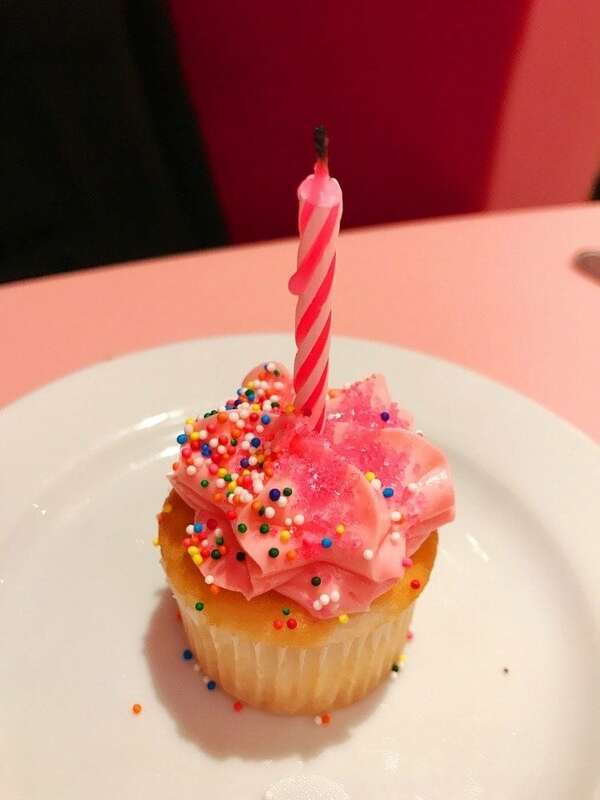 They brought out this super cute mini cupcake with a candle for her to make a wish and blow out. This is the perfect place to take those who love American Girl! 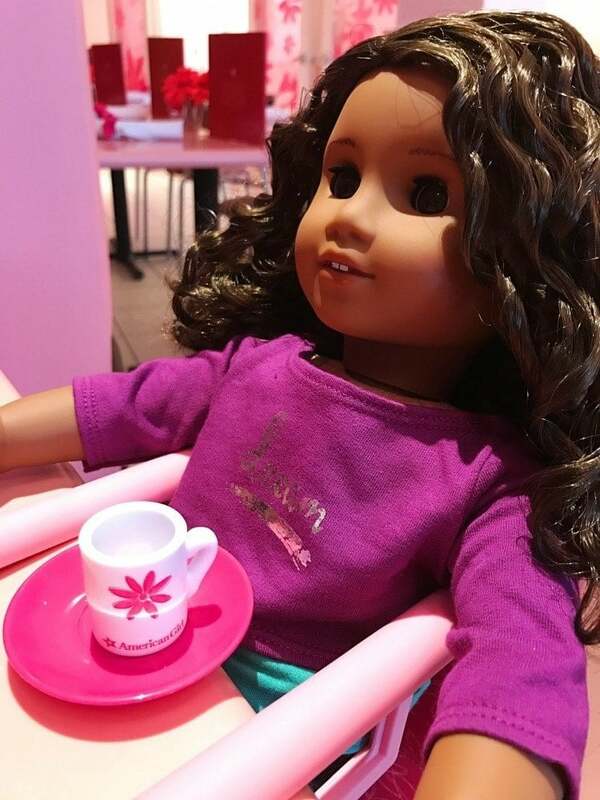 My daughters always think dining at the American Girl Bistro is so incredible – a day to remember. The American Girl experience is wonderful and special on any level and can become an overnight experience if you would like. They offer American Girl® Store packages as well. There are two partner hotels. The Marriott and the Residence Inn by Marriott. This is definitely on our wish list for next time. Wow! I didn’t know that American Girl had a Bistro. My granddaughter would love this. It would be worth the trip from SC. Thanks! Never knew there were American Girl Restaurants! She looked like she had a great time! Great post! Before reading this, I didn’t know that there even was an American Girl Bistro! It looks like a wonderful place and the food looks delicious! Happy Birthday to your daughter! I would love to take my nieces here! Wow! That is adorable..and the food looks great too! It looks like every girl’s dream! Such a sweet little place! I had no idea it existed, so I really enjoyed reading your blog about it!